Who says Tatooine has to stay in a galaxy far, far away? With the resurgence of the “Star Wars” franchise coinciding with Pittsburgh’s erupting big-ticket film scene, Steeltown seems as poised as any other American city to host the Millennium Falcon. 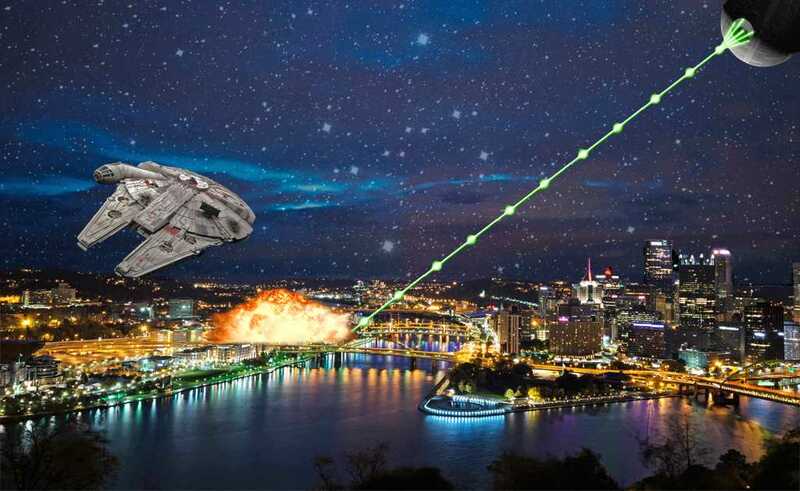 From the plethora of abandoned industrial relics to the long, winding rivers, Pittsburgh has a lot to offer the thrilling galactic series, if only for exterior clips. The forsaken industrial structures that sit abandoned alongside the Monongahela River could provide plenty of harsh and rugged scenery. Past American set locations have included Oregon and California woods, while much of the original trilogy’s production took place in London studios. With modern-day CGI capabilities, though, producers could reimagine the Rust Belt’s industrial ruins as an intergalactic space pub or vessel. Kathleen Murray, a member of Pitt’s film and English departments, said Pittsburgh could be a habitable environment for the franchise, even if that means hiding the iconic bridges and architecture. Will Zavala, an associate professor with Pittsburgh Filmmakers, said Pittsburgh could offer more than just abandoned warehouses and steel mills. Thanks to green screens and CGI, film and editing crews can shoot wherever they like, Zavala said, and then edit the shots to show what they need. Zavala also said he was not concerned “Star Wars” would be too big a production for Pittsburgh. “Pittsburgh has proven itself with the ‘Dark Knight’ production,” Zavala said. While Pittsburgh may not offer the desert wastelands appropriate for major scenic locations like Tatooine or Hoth, Murray said the city could host smaller scenes. Lisa Smith-Reed, assistant director of the Pittsburgh Film Office — a nonprofit economic development agency that works to promote Pittsburgh and southwestern Pennsylvania to the film industry — said filming in the area has had an economic impact of over $1 billion since the agency’s founding in 1994. Will Zavala added that film crews usually film for about six to eight weeks, which is enough time to do some serious spending. While the Pittsburgh Film Office works to attract projects to the region by offering a 25 percent tax break for projects spending at least 60 percent of their production budget in-state, the looming state budget problem may undo some of that work. Despite the political barriers, though, to Murray, Pittsburgh offers a habitable environment for production teams, actors and crewmembers alike.